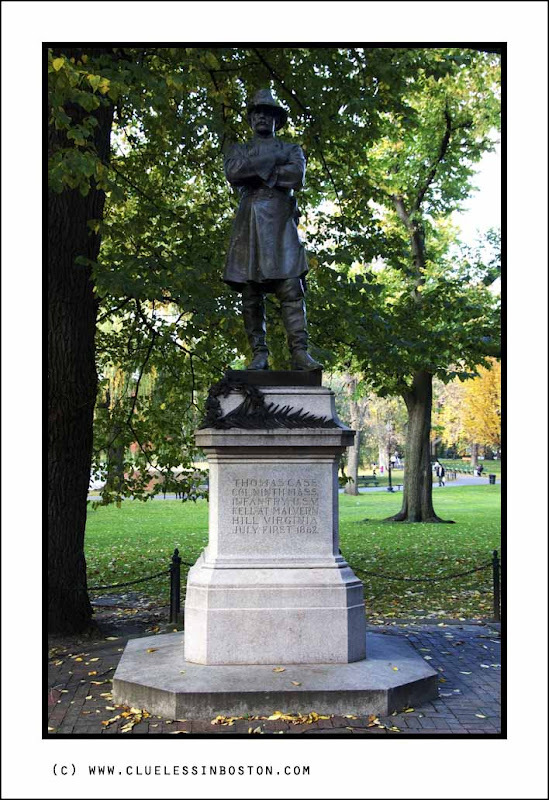 Today is Veteran's Day in the U.S. and I thought I would forgo the usual Wednesday Doorway to show the statue of Colonel Thomas Cass. Thomas Cass (1822-1862) was born in Ireland, but moved to Boston and served as Colonel in the Ninth Massachusetts Infantry U.S. Volunteers, a regiment of Irish volunteers known as the "Fighting Ninth." He was killed at Malvern Hill on July 1, 1862. The sculpture was secured through the efforts of Mayor Joseph Quincy and was funded through the Jonathan Phillips Fund. It replaces an earlier granite memorial to Cass. The eight foot tall statue depicts Col. Cass with his arms folded across his chest. He is dressed in his Civil War uniform that originally included a sword which is now missing. The sculpture rests on a square base adorned with a bronze wreath and a bronze palm branch on the front upper left corner. On front of the base there is the legend: Thomas Cass Col Ninth MASS Infantry USV Fell at Malvern Hill Virginia July First 1862. On rear of the base is the legend: Erected by the City of Boston In Memory of the Officers and Men of the Ninth Reg MASS Volunteers Organized May 3, 1861 Mustered out June 21, 1864. 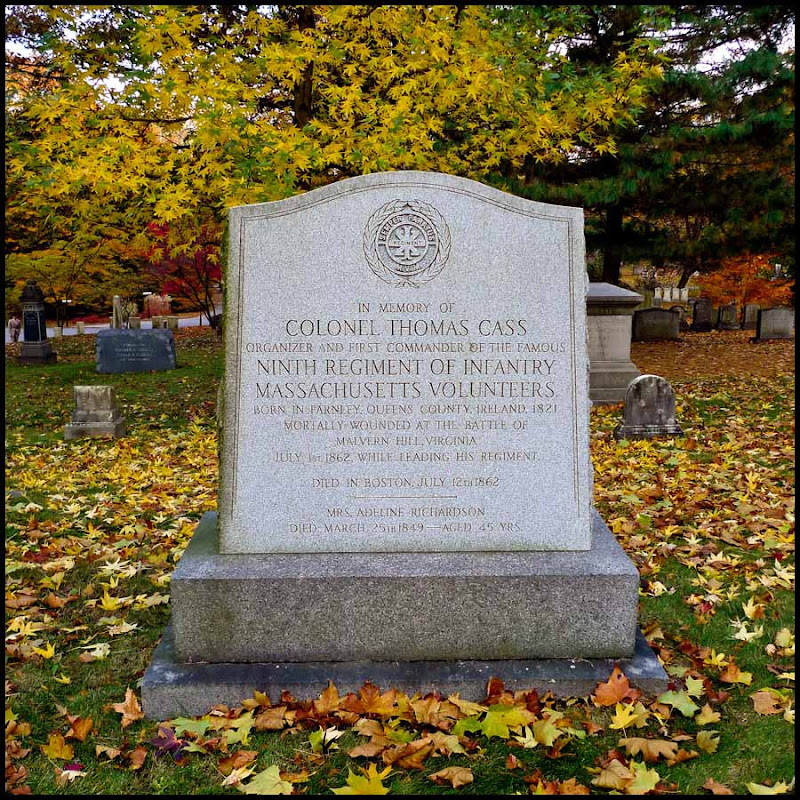 Below is the grave of Colonel Cass at Mount Auburn Cemetery in Cambridge. I've been there and saw it for myself. In Indonesia, Heroes Day (which I think has more or less the same purpose as the US Veteran Day) is on November 10. A great pair of images to remember a very important day. Love the statue, but the second one is really magnificent for the background. Over here in the UK it is Remembrance Day, and my post for today and the next few days relates to that. Superb post for the occasion like today! We celebrate the Independence Day here in Poland today. I have never seen that statue before...at least not that I remember. I may have walked by it unawares. Where is it? who came over and fought in the civil war. They died at Gettysburg. Three of them and they were all brothers. It's a good day to learn a little piece of History. I remember Mount Auburn Cemetery. An interesting place to wander around. It's a beautiful post and nice homage! What a nice memorial! That's a beautiful picture of the grave with the fall leaves on the ground surrounding it. This is a great post for Veteran's day, the memorial is beautiful, the statue makes him look stately.